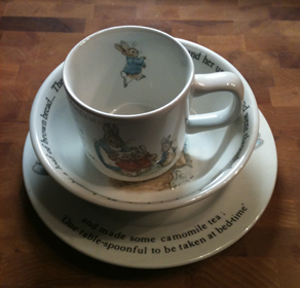 The three piece set is of Beatrix Potter’s famous illustrations of the cute and often mischievous rabbit. 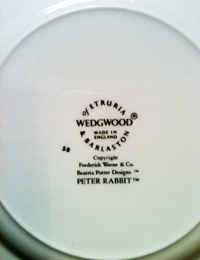 It is also made by Wedgwood. I remember growing up looking at that name on the bottom of my parent’s “good china” (mainly because they had to be hand-washed). My favorite part of this set is Peter hiding inside the mug. It’s a fun surprise if the cup is full of something opaque like milk. Be on the look out for this adorable set in the One of a Kind Finds section of StudioGatz, which will be opening soon! Stay tuned to Gatz Chats to find out when.